Mix up thawed ice cream well so that it is easily spreadable. 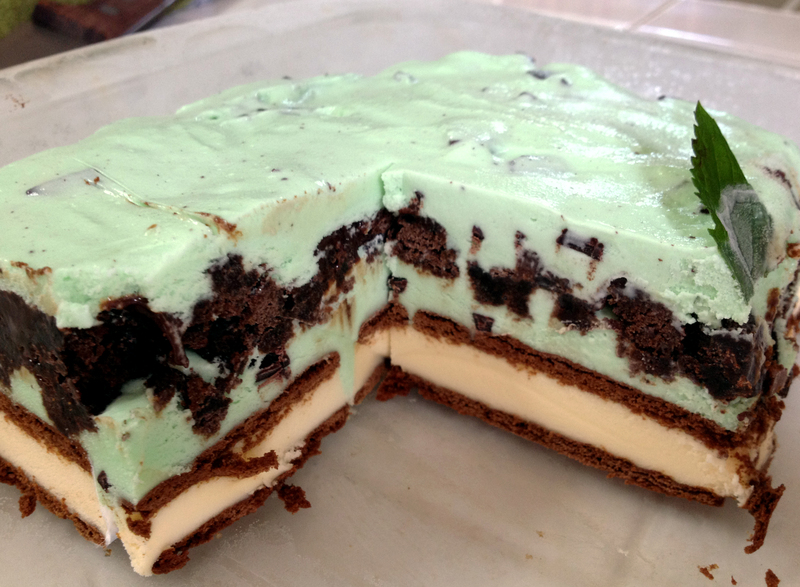 Spread an even layer of ice cream (about ½” thick) over sandwich layer. Place pan in freezer for 30 minutes. Heat hot fudge in microwave for 20 seconds – just until slightly warm. Stir well and let cool. Pull rest of Mint ice cream from freezer. Let thaw several minutes and mix well so that it is easily spreadable. Spread even layer of ice cream (about ½” thick) over brownie/fudge layer. Garnish with several fresh mint leaves. Freeze cake until ready to serve.